Why is native advertising that is marked clearly more effective than the vaguely labelled sponsored content? One of our Native Ad Voices is here to explain. Presentation: Pontus Staunstrup is Head of Content strategy and Social Media at PostNord Group. Prior to that he was Content Strategy Director at one of Sweden’s leading content agencies. He has extensive experience of working with content marketing and content strategy as well as social media for a number of Swedish and international companies in both B2B and B2C. Pontus is also a frequent speaker and writer on topics like native advertising, digital strategy and content marketing. He is a member of PostNord’s steering group for native advertising, as well as lead strategist and analyst. One of the most frequent topics when native advertising is discussed is if it tricks the visitor to a media site into believing that the ad is editorial content. There is a broad suspicion among especially journalists and those working in traditional advertising that deceiving the visitor is part and parcel of native advertising. I firmly believe that we need to take every precaution to make sure that visitors to media sites never are in doubt about if the content they’re reading or watching is editorial or paid. There is absolutely no point in trying to trick the visitor, rather there is a big downside as it will have a negative impact on how the brand behind the ad is perceived. But just like no sane person or brand would seriously advocate selling ”crunchy frogs”, we should look at the ad markings as beneficial to the whole concept of native advertising. It should be clearly marked because we really don’t want to end up deceiving anyone. Rather state that it’s an ad a couple of times than run the risk of the users not being in the clear. Which makes it a bit worrying that according to research from Contently a lot of visitors to media sites tend to identify native advertising as editorial content. The key take aways from Contently’s study is that it depends to a large degree on how clear the markings are and how transparent the brand is about that it’s using native ads. Media sites like New York Times and BuzzFeed, that have used very clear markings since the beginning, did better than other sites. From what I’ve seen in the Nordic countries, markings have been very clear here as well on most media sites, and that is good news. One thing I have not seen on many sites is a clear marking that both defines the content as an ad and then identifies the brand behind it by displaying its logotype or similar. That might have an additional impact, since many visitors recognize and respond to the logo – where they may not notice the ”sponsored content” or ”advertisment” markings used today. Using logos and similar could also provide a lift to the effectiveness of the ad itself, since a study from Polar reports an increase of click through rates (CTR) of 15% when a logo was included. But the main thing is to decrease the number of people that mistake native ads for editorial content, and as a result of this feels cheated or lose trust in the media platform. 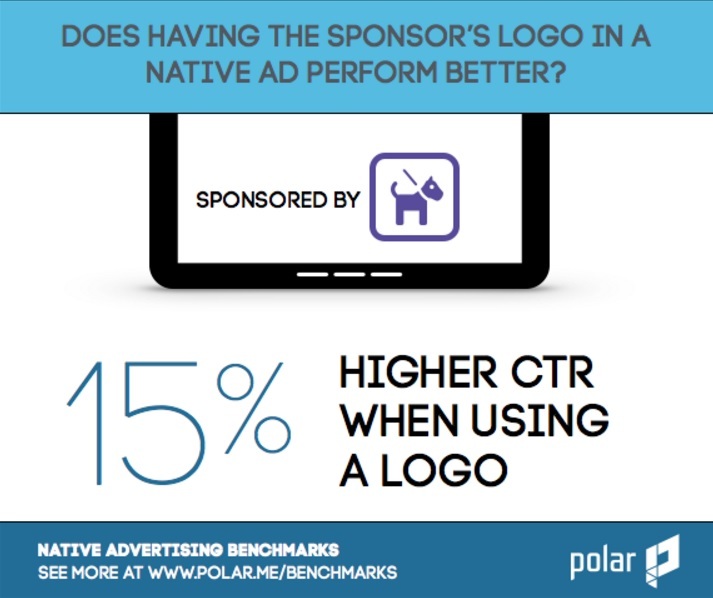 Just like media sites need the income from native ads as other types of digital ads become less effective, so does brands need native ads as a way of telling stories important to them the audience of that platform. Neither has any interest in making the visitors feel this way. To a degree I think the relative inexperience with native content explains why this happens. As people get more used to native ads this will be better at telling the difference. But that should not keep brands and media sites from actively pursuing ways to make it crystal clear what native advertising is and how it differs from editorial content. It’s in all our interest to do this – brands, publishers and first and foremost the audience. Otherwise we might see native ads becoming impossible to use very soon.